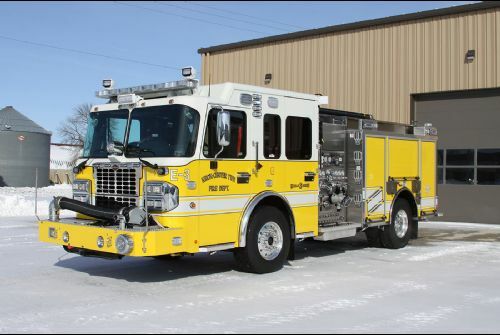 Knox-Center Township Fire Department Replaces Older Apparatus with A New Toyne Pumper | Toyne, Inc. Mounted on a Spartan Metro Star MFD chassis, Toyne customized the bolted stainless steel pumper to the department’s needs. A 450 horsepower Cummins ISL 9 engine powers the pumper and the powertrain includes an Allison 3000 EVS transmission. Water is stored in a UPF 500-gallon tank and features an Innovative Controls tank gauge. The pumper is outfitted with a Waterous CSUC20 pump, which is capable of moving water at 1,500 gallons per minute. Knox’s pumper is equipped with a Task Force Tips Y4-E Monsoon Series electric monitor, as well as a FoamPro 2001 Class A system. Two different telescoping light models from Fire Research make up the pumper’s lighting system, models SPA530-Q28, and SPA250-Q20. Formed in 1911, the Knox-Center Township Volunteer Fire Department has over a century of firefighting history in the communities of Knox and Center Township. The department consists of 25 volunteers and operates out of two stations. They serve an area of 36 square miles, with over 6,250 residents under their watch. In 2017, Knox firefighters responded to over 250 calls. Along with fire calls, the department handles EMS, accidents, and water rescue calls. Their new Toyne Pumper is just one of more than ten apparatus the Knox Fire Department uses to respond to emergency situations. Learn more about the Knox Center-Township Volunteer Fire Department by visiting www.cityofknox.net.